We’re raising a glass to more exciting developments today. As you may recall, I recently turned 30, started a new job, and I’ve just purchased my first home! I take possession of my new condo on Thursday. This is a very big step but I am looking forward to living the downtown bachelorette lifestyle. I’ll be the one handing out roses on the elevator. After 10 months of living in my parents’ basement (grateful as I am for their hospitality), I’m pretty thrilled to be expanding into my own space – with full reign over my domain (read: the kitchen). I am a bit of a decor enthusiast and have owned an entire house’s worth of furniture since I was 21. The dining table will be reassembled, my midcentury modern couch, my chartreuse wingback chair and my many, many throw pillows will all come out of storage. The condo I’m moving into was built in 2009, so it’s not looking too long in the tooth yet. That being said, I am planning to do a lipstick makeover with a fresh coat of paint, this gorgeous wallpaper as a feature wall behind my bed, new backsplash and countertops. I’m most looking forward to displaying my art collection again. Two of my most prized possessions include this original painting by Toronto artist Judith Geher, and this 1952 Barilla pasta ad illustrated by Erberto Carboni acquired from L’Affichiste in Montreal. I attended the Glebe Neighbourhood Association Home Tour this past Sunday and left with plenty of decor and paint colour inspiration. I’m going to paint out the standard varnished oak cabinets with a sleek, matte dark blue called Cyberspace from Sherwin Williams. I’m planning to do a stunning white and grey floral marble backsplash and white quartz countertop with some flecks of grey. I’ll pull it all together with antique brass drawer pulls and door handles. I can’t wait to show you the before and after on the blog when it’s all said and done. You can bet your bottom dollar I’ll be throwing one hell of a housewarming party. Maybe I’ll even serve up this On Tilt Old Fashioned. You might be wondering how I achieved this tilted ice slide in the glass. Now, they do sell a “whiskey wedge” ice mold but you can only use the mold with the glass it’s sold with. For a cheaper and easier alternative, simply fill a rocks glass halfway with water. Place the rocks glass in a muffin tin, angled so that the water just reaches the lip of the glass and freeze for at least four hours. The beauty of this method is that you can create tilted ice molds in all of your rocks glasses at once. In addition to the “tilted” ice in the glass, this Old Fashioned mixes it up with a honey syrup in place of the standard fare sugar and used Coffee & Pecan Bitters from Kinsip in place of Angostura. The effect is a warmer, autumnal version of this classic cocktail. Have one of these drinks and think of me painting away my new place later this week! If you have any recommendations on your favourite home decor, art, or furniture stores, drop me a line in the comments below! 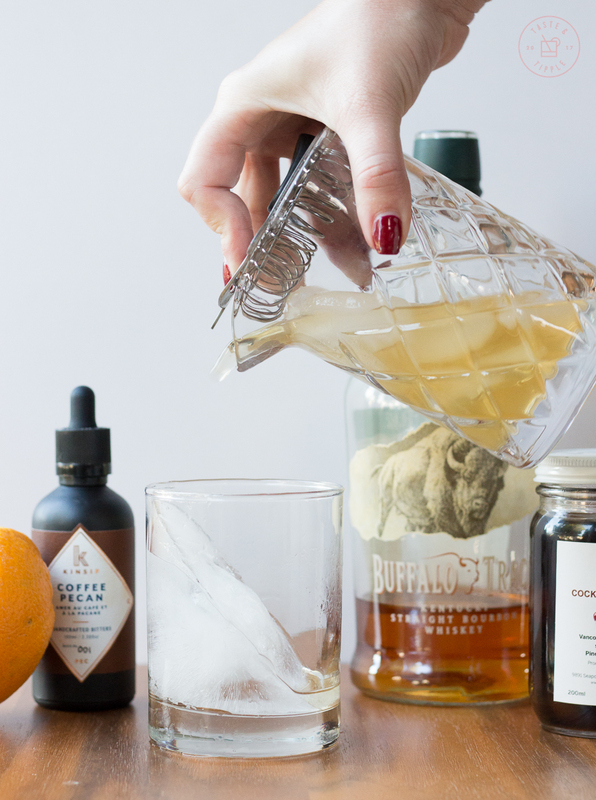 Combine bourbon, honey syrup and bitters in a mixing glass filled with ice. Stir for 20 seconds. Strain into ice tilt rocks glass. Peel off a thick band of orange peel and twist into glass, run around the interior rim of the glass and drop. Top with cocktail cherry. Ice Tilt Glass: Fill rocks glass halfway with water. Place glass in a muffin tin and tilt so the water just reaches the lip of the glass. Place in freezer for 4 hours or longer until water is frozen and you achieve the ice tilt! Congratulations Yvonne. I am thrilled for you. What is the new job. Did I miss a blog? Thanks Ali! I’m the freshly minted Business Development Manager at Abacus Data. We are a market research and strategic consulting firm that helps organizations tackle the challenges of generational change and technological disruption. I alluded to this exciting new development in my Apple Sparkler post! Thanks for following along and for all your support! Yahoo……that job fits your skill set, right on. I have to check that blog. I may have missed it. Damn.